Too often, marketers get wrapped up in the features and functions of their products, rather than solving the actual problems of the consumer. That leads to a lot of one-upmanship versus competition and over-bundled products that don’t handle any one feature particularly well. 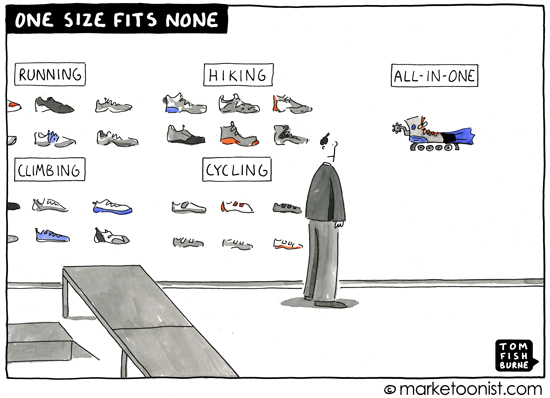 Marketers also tend to average out all of the feedback from consumers, ending up with one-size-fits-none products. I recently heard Clayton Christensen, one of my favorite HBS professors, give a lecture at our 10-year business school reunion. He said that marketers frequently focused on the wrong things, leading them to target “phantom needs”. To illustrate the “jobs-to-be-done” method of marketing, Professor Christensen told the story of milkshake development (which he also described in this fascinating HBR article). A fast food restaurant wanted to increase milkshake sales. They first asked target consumers if they wanted their milkshakes more chocolatey, cheaper, or chunkier. This approach had no impact. The fast food restaurant then investigated the jobs consumers actually hired the milkshakes to do. They discovered that many milkshakes were consumed, surprisingly, early in the morning. It turned out that the morning milkshake was “hired” to solve a “boring-commute” problem. Once they understood that “job”, they optimized that milkshake with prepaid swipe cards and made them thicker to last longer in the commute. They found another very different “job” in the afternoon, with dads who were tired of saying “no” to their kids all day and wanted an easy win. The fast food restaurant did two things of interest: 1) they actually embraced what they found in their “investigation” (cleverly not called “research”, at least in this article); and 2) they were willing to take a step back from “feature-vs.-feature” to consider the bigger picture, i.e. the consumer perspective of needs/interests. This can take some courage on the part of the marketer – willing to serve up a different thought process, do battle with those favoring the “tried and true”, etc. And yet I’m guessing the more memorable marketing efforts we might recall likely sprung from that (but with a dose of caution regarding overdoing it as Tom and we loyal followers covered in a recent post about “brand laddering”). Research is a frequently debated topic, it’s been a subject here in the past, not wanting to rehash it but just pointing out that it played a positive role here – because someone was willing to accept the results and in this case, push past the first round to dig deeper. And then work with the findings. Seeing the consumer’s needs and interests through their eyes would be considered fundamental “marketing 101” but we can limit ourselves by ignoring “peripheral vision” – in this case, the product itself (thick, chocolaty, etc.) might be the product focus but it took a broader look at the consumer’s overall experience with the product to uncover a unique perspective. Some things to be learned from this, I think, but one final thing which occurs to me in particular is that this is all about a milkshake. A relatively simple product which I’m guessing most of us don’t think much about nor would we consider it a complicated product to market. Like many such products, easy to take it for granted and yet here’s a good example of the benefit of applying the same process to milkshakes as we do for power tools! I find that all too many of my stakeholders want the “Swiss Army Knife” of software. They are unwilling or unable to rank their needs which would enable me to deliver the high-value pieces first – an approach that is the core of the Agile methodology. This puts me in the role of mind-reader. 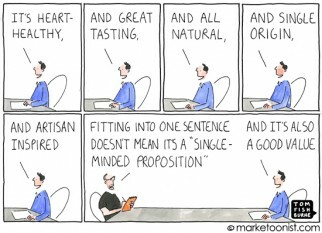 In many ways, I suspect that most in marketing feel that they are mind readers. It’s not always easy to understand the “job” that people want done. I’m in the business of marketing early education. People have very specific ideas about the “job” they want us to do with their children. We are always most successful when we discover their needs/wants. The hard part for us is getting the front line people on board with this. 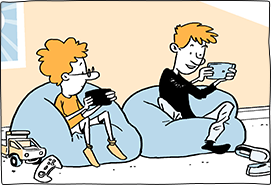 This week’s cartoon and article are a great jumping off point for a fabulous discussion. Thanks! At Toyota, they believe in genchi genbutsu (“go and see” for yourself). 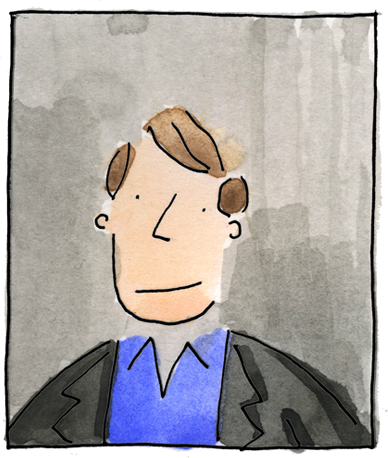 The best way to understand the “job” to be done is to get out of the office and observe or actually experience how your customers are using the product. Tom, enjoyed your insight very much. While social media allows us to interact with many more people, it’s important to remember the importance of face-to-face conversations. 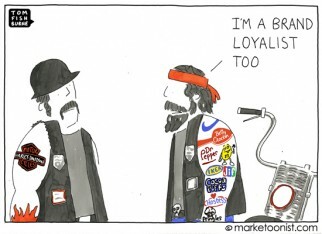 Customers may “like” you on Facebook but not really love your brand or your product. Yes Derek Christensen… thanks for the reminder of where I heard the milkshakes for breakfast story…Clay Shirky pointed out that they found they were bought at the drive thru not to make a boring commute more interesting, but to provide “portable sustenance” that could easily be consumed while driving …not exactly how I think about milkshakes (I think of them as fattening/dessert/a rare treat) but apparently many Americans are willing to drink icecream for breakfast. (I also remember the opening season of The Apprentence when the winner of the ice cream contest was the team that mixed donuts in the recipe and thus could sell it as a breakfast food with the suggestion, “Hey, it’s donuts!” while the other team (Red Velvet Cupcake icecream) didn’t make any sales til after lunch! The actual person who did the milkshake research was Bob Moesta who is the founder of the Rewired Group: http://www.therewiredgroup.com/. Moesta worked with Christensen and the two together developed the Jobs to be Done theory. What great commentary on this cartoon, thanks! 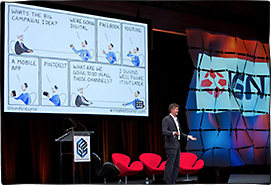 I even saw that Clayton Christensen shared the cartoon with his audience. Thanks to Derek and Michael for sharing the more details on the research. This week’s print goes to Bill. It’s an important reminder that research, when done well, can be very powerful. Too often, research is a C.Y.A. checkmark, but there’s a lesson here for research that challenges our assumptions and status quo.